Traditional hummus gets a flavor boost from fragrant basil pesto to create this delicious twist on the popular dip. Last fall, Rachel and I were working our butts off preparing to host the first ever Taste of Michigan blogging conference. Before the luncheon, I was scheduled to demonstrate my Great Aunt Vieve’s Classic Hummus with Toasted Pine Nuts recipe using a beautiful KitchenAid food processor. Your pita bread is waiting. 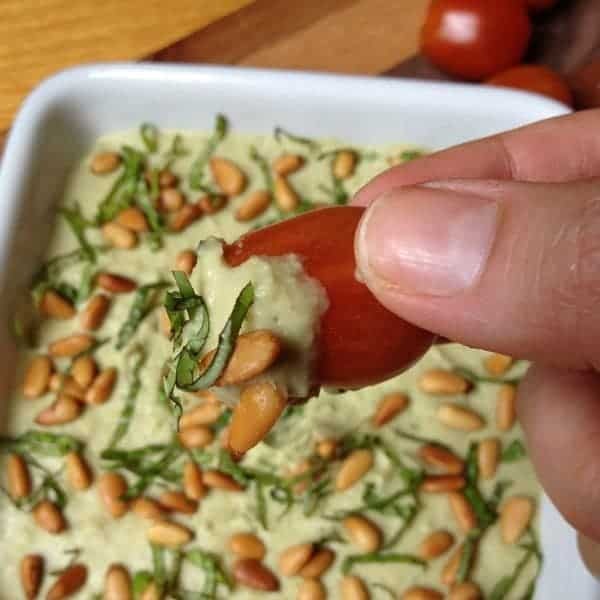 Bright pesto and creamy hummus come together to create this addictive and flavorful dip perfect with veggies, pita or tortilla chips. Pre-heat oven to 350 degrees and spread pine nuts in even layer on a baking pan. Bake for 5-7 minutes or until browned; let cool. In a food processor or high speed blender, pulse together chickpeas, pesto, olive oil, lemon juice and salt. 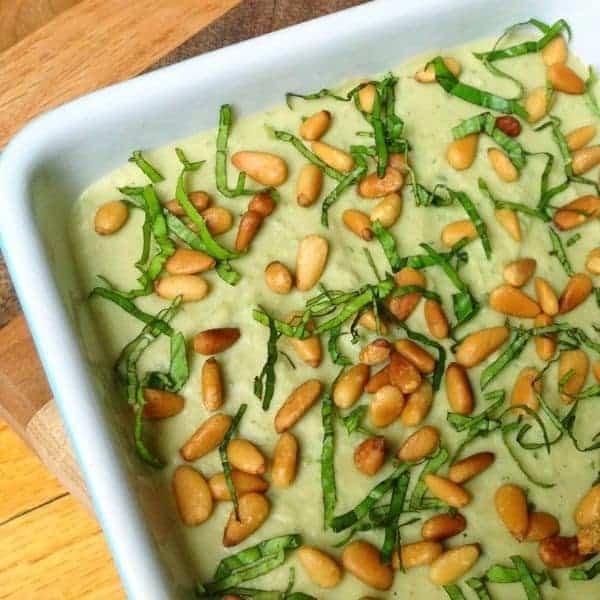 Puree mixture until smooth and creamy then spread on a platter and sprinkle with toasted pine nuts and minced basil. If the mixture is too thick, add up to 1/4 cup of water or until desired consistency is reached. I made a bunch of pesto to freeze last week, and pulled some out to make this fabulous hummus!! Loved it! Oh good!! Perfect time of year to do that!! 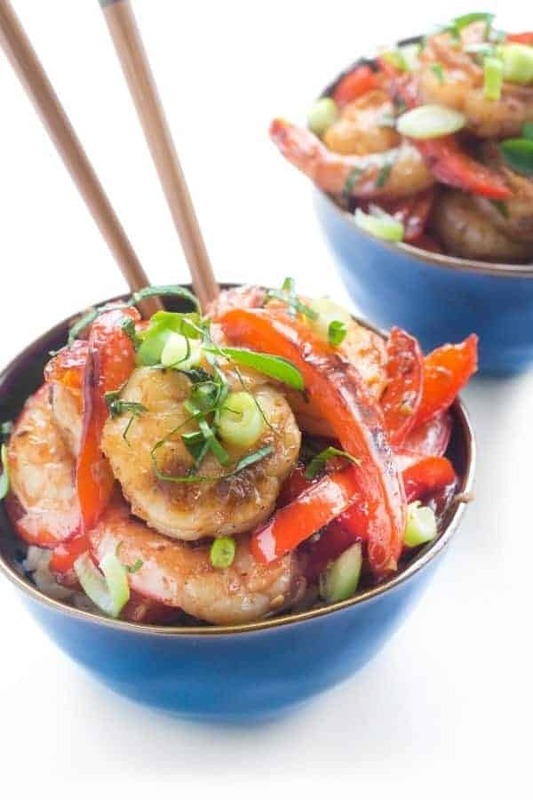 What an awesome recipe to bring to a birthday party! 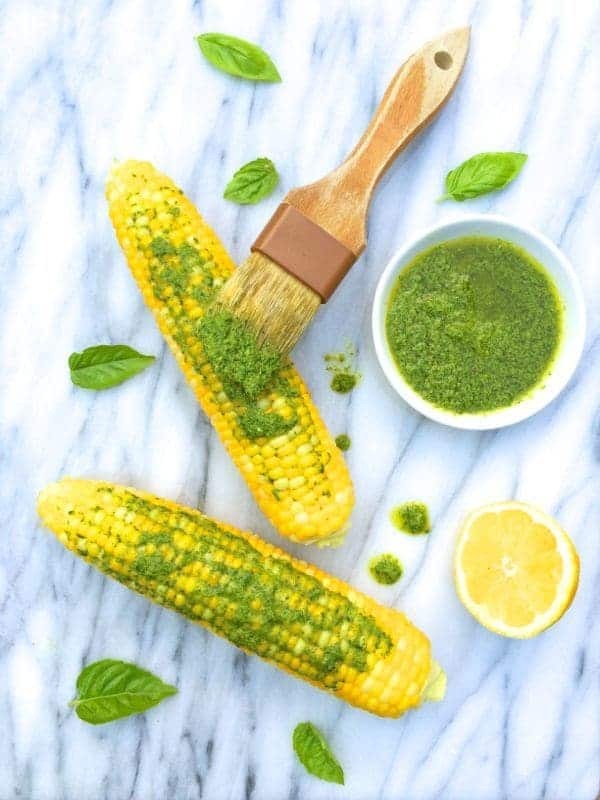 Love the idea of combining basil pesto with hummus! I don’t know why I never thought to combine them before!! Hummus with pesto mixed in pretty much sounds like the best thing EVER. I’m making this ASAP! Hummus without tahini?! Now I know what to do when I’m all set to make hummus but realize at the last minute that I’m all out of, not chick peas, but tahini. Exactly! This is perfect for that! Love the flavors in this hummus! Delicious! Thanks Julia – it felt weird to stray from the classic but this worked! Nice recipe, Liz. Happy 30th to Rachel. Enjoy – it goes fast! That looks like a cool twist to hummus! I usually don’t like other manipulated versions of hummus. Specially when there’s no hummus (chick peas) in it!! I think it will be cool too to use cilantro instead of basil and lime instead of lemon. And hey! I have to add cumin. Usually chick peas or any peas cause some gases we believe that you get rid of it by cumin. I don’t normally like manipulated hummus versions either but this was a natural fit. Love your suggestions too! I love hummus, I can’t wait to try this out!! Thanks sista!! Hope you’re having a great trip! PS: I wasn’t even mad about the Taste of MI hummus craziness. It was hysterical…after all that planning. Too funny. Pass me some pita, I’m ready to dig in! 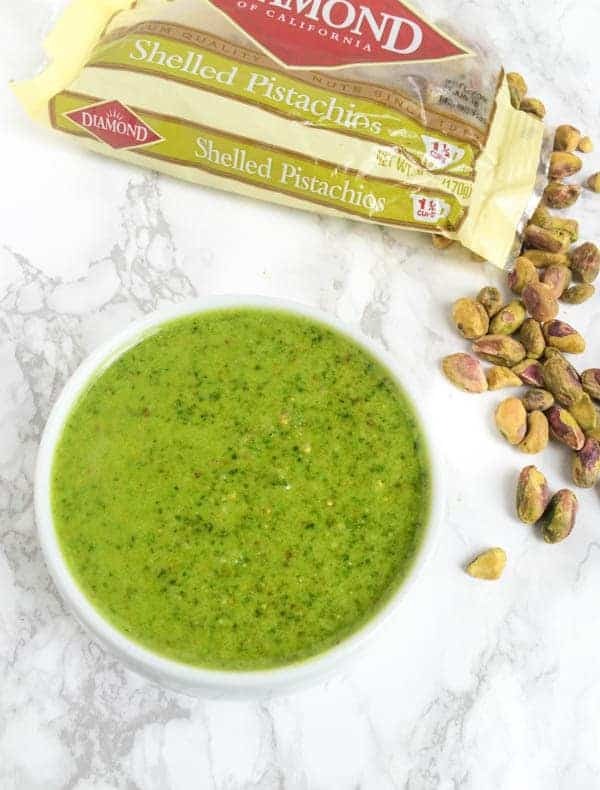 I really love the the pesto addition….such a tasty change up my classic hummus! Passing you pita right now!! I so wished to attend the Taste of Michigan with you and Rachel, what a fun event. I had to laugh about the chickpeas, that sounds like something that would happen to me! I love pesto and I’m pretty sure I could devour this whole dish of hummus! You are such a nice friend, Liz! This basil pesto hummus looks and sounds incredible! 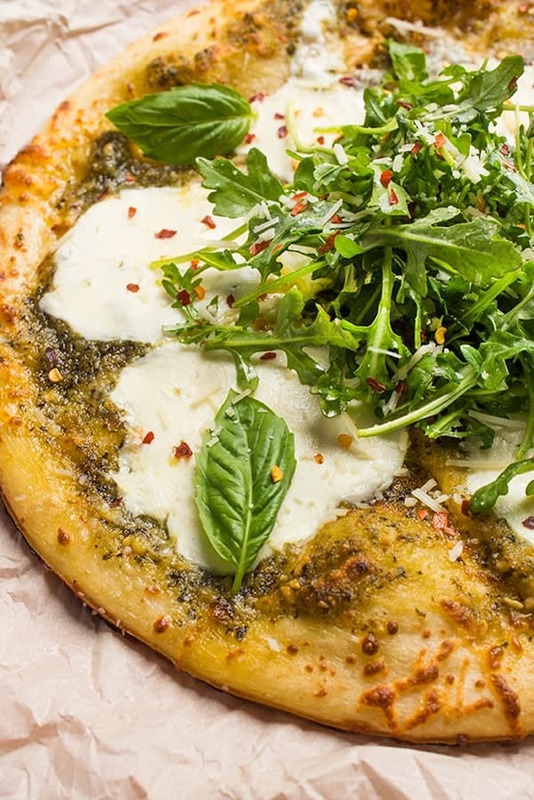 I am always supper excited when the words basil pesto are included in a dish. YUM! Of course you had to make hummus! Looks delicious! Happy Birthday to Rachel! 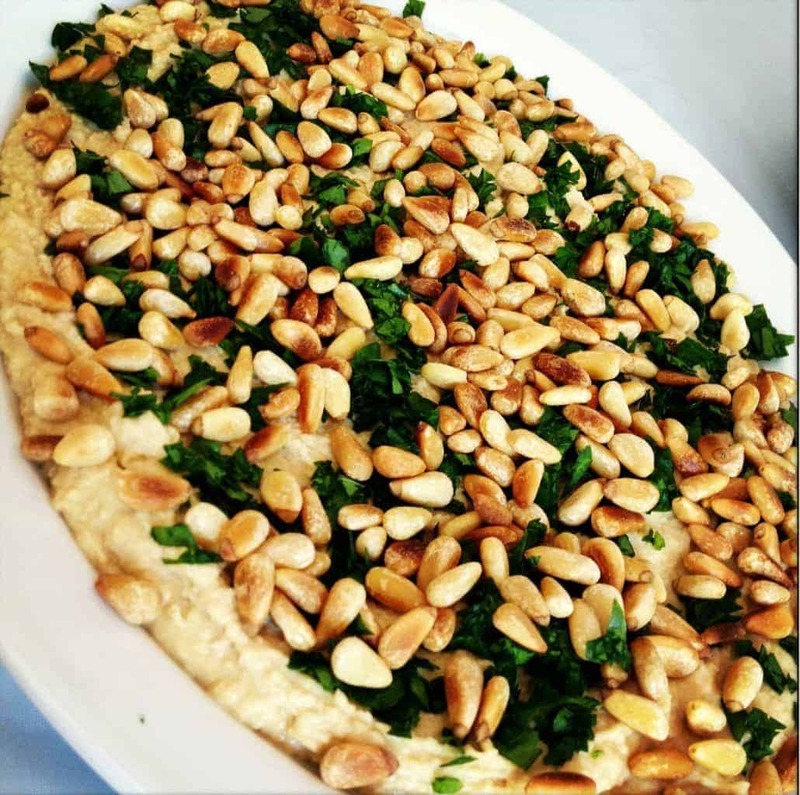 You know I can’t resist another hummus recipe!! TGIF!